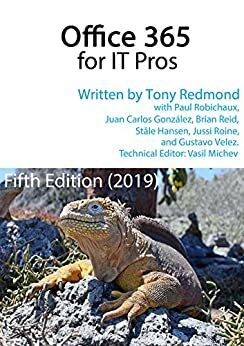 The Office 365 for IT Pros writing team is proud to announce that the thirteen update for the 2019 edition is now available to subscribers. The updated files are dated April 15, 2019 (see the inside front cover for version data). The companion volume has not been updated. Update #13 includes changes to 14 of the 24 chapters (plus an update for the sponsor chapter), so it’s a reasonably big release. Included in the changes are new data loss prevention policies for Teams (22), integrating Microsoft Search for Bing into Office 365 (9), the General Availability of Live Events (16), and hard deletes for compliance searches. Apart from these specific changes, the update includes many other small changes from our work to track developments inside Office 365 (like environments for Flow) or incorporate new elements of best practice. The number of changes, some large, some small, underlines once again that ePublishing is the only practical way to cope with technical information about Office 365. How many other technical (or otherwise) covering Office 365 have offered their readers 13 updates? The full set of changes is described in our change log. In addition to updated text about new features and information, we have completed periodic technical reviews of several chapters. The web never remains static, so hunting down and fixing hyperlinks is a never-ending task. Subscribers to the PDF/EPUB version should log into their Gumroad library to download the updated files. The updated files are completely new books with the new content integrated into existing text. You don’t have to cut and paste change information into an existing book. If you can’t remember details about your Gumroad account, find the original receipt from when you bought the book and use the View product link in it. We have asked Amazon to send notifications to purchasers of the Kindle version that updates are available. See our FAQ for more information about how to download updates. The Office 365 for IT Pros team would love to hear from you. We welcome tips about new features, ideas for what you’d like to see covered in the book, and information about any issues you find. Please use the contact form on this site to connect. And now we start working on the May 2019 updates. Nothing about Office 365 ever stays static for long.